Well, as the news about Harrison Ford’s injured leg got increasingly worse—from he hurt it to it was a sprain to it’s broken—you probably saw this coming. It looks like filming on the much ballyhooed Star Wars: Episode VII could be delayed significantly, which could cause Disney and Lucasfilm to postpone the theatrical release date. This rumor, and we can’t stress the word rumor strongly enough, originated with Jedi News. 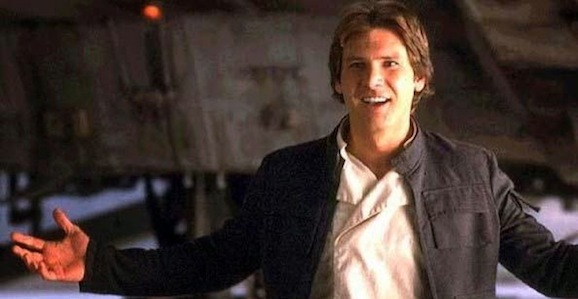 Multiple sources have told them that there was an emergency meeting held at Pinewood Studios and “that production of the film could be pushed back by a substantial amount of time.” Again, this is all hearsay from unnamed sources, but if this is true, and filming is suspended and rescheduled because of one actor, it does seem to support the earlier reports that Ford, and Han Solo, does in fact play a considerable role in the upcoming film. If this comes to pass, it won’t be the first time that Episode VII has been delayed. Originally slated to open in May of 2015, that date was quickly pushed back to December 18, 2015. Both Disney and Lucasfilm were reluctant to move the release back—Star Wars movies have traditionally opened in May—but they definitely needed the space as things didn’t come together quit as quick they anticipated, especially with delays in the scripting process. At one point director J.J. Abrams and Lawrence Kasdan took over the screenwriting duties from Michael Arndt (Toy Story 3). The later release date still kept the film in 2015, but only by a razor thing margin, and with no room for error. Should these rumors prove true—many people are saying the delays could be up to six months—there is little to no chance that Episode VII will be finished in time to make that date. Questions then arise about the entire timeline of the Star Wars movies moving forward. We know that there is a schedule in place that will supposedly see a new addition to the franchise drop every year until 2020. Gareth Edwards (Godzilla) and Josh Trank (Chronicle) have both been tapped to direct standalone films that will alternate with the Episode movies. And just the other day, it came out that Looper’s Rian Johnson could direct and write Episode VIII and possibly Episode IX. If the release of Episode VII is pushed back, where does it go? Disney already has a number of huge movies scheduled in 2016. The Avengers: Age of Ultron opens in May, Pixar’s Inside Out arrives in June, and Ant-Man is slated for July. It’s possible that they could reschedule one of those. With Edgar Wright dropping out of Ant-Man that one seems like a prime option. And we all know that none of these movies, not even Avengers 2, is going to be as massive as a new Star Wars, so wherever they fit it in, there’s going to be a mad scramble by other studios to put distance between this and their tentpole releases. We’ll have to wait and see if, one, these rumors are true, and two, how Disney deals with them. Some have even suggested that there could be massive rewrites to circumvent the problem. If this is true, I hope they delay the film instead of trying to find a work around. As much as I want to see a new Star Wars movie, I’d rather wait a few extra months and see the movie they want to make rather than just a movie they can crank out in a tight timeframe. I think most of us are in the same boat on that front. I’d happily take the delay. It doesn’t feel right; a Star Wars movie not releasing in May.